Does your beautiful newborn child have an awful rash of acne on his or her innocent skin? Does looking at your beloved infant son or daughter make your heart break as you wonder if they’re always going to be plagued by painful acne spots on their tiny little face? 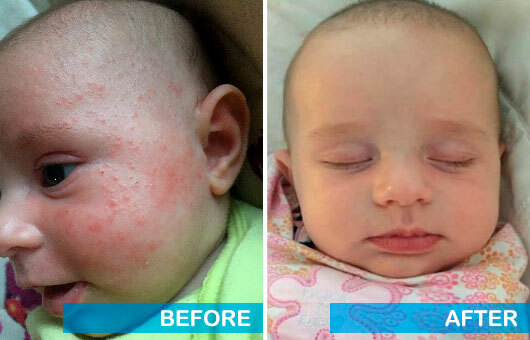 If your baby has acne, then you’re probably panicking and wondering how you can cure it as soon as possible. Please keep reading to learn guaranteed methods to quickly and gently eliminate acne pimples from your baby’s face. Acne isn’t a curse that exclusively attacks pubescent teenagers; babies are indeed quite susceptible to this vexing disease. The question, therefore, that remains is: why? A baby isn’t about to grow hair on its chest or find its voice cracking unexpectedly – they can’t even talk yet! While the jury is still out on the exact cause of baby acne, most doctors agree that the primary trigger for baby acne (also known as “neonatal acne”) is hormones. A newborn human has a significant amount of lingering hormones from his or her mother in their body, which results in a crop of acne across its face or body. 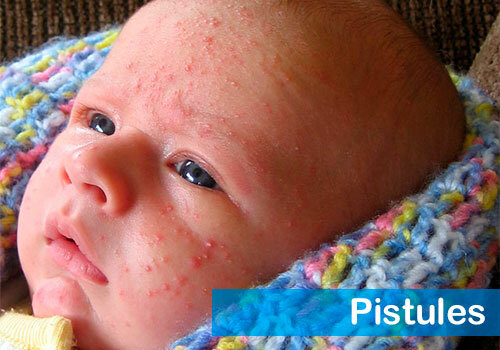 Click here to find out more about what causes baby acne. It’s important to note that not all bumps on baby’s face is necessarily acne. 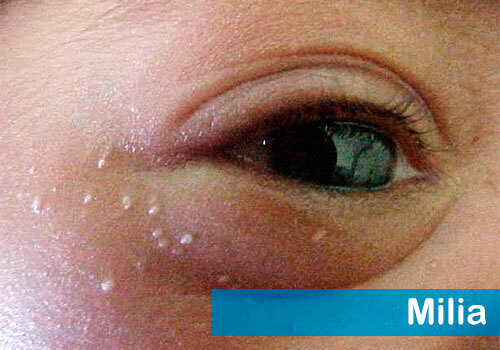 Allergic Reaction: Allergies oftentimes manifest as raised blisters or pustules on the skin. Many allergenic foods can cause reactivity just from touch, so be mindful when exposing a child to anything with soy, gluten, dairy, peanuts, or any of the other major allergens. Contact Dermatitis: While the symptoms of contact dermatitis may seem very similar to acne (including fluid-filled lesions and pustules), its causation is vastly different. This is also different from allergic dermatitis. Sometimes certain skincare or hygiene products may have irritating ingredients (such as camphor or menthol) which could cause inflammation on the delicate skin of your baby. Eczema: Also known as “atopic dermatitis”, its symptoms can also be mistaken for acne. Triggers include genetic predisposition, seasonal allergies, dry skin, and bug bites. It manifests as weeping pustules and thick, itchy, scaly skin. Psoriasis: This is a chronic disease that is caused by an excessive buildup of skin cells. Symptoms include red patches of skin with thick, silvery scales. A visit to a doctor may be required for proper management of this immune disorder. Baby acne shows up fairly quickly after childbirth. The initial onset for neonatal acne is typically within two to four weeks of age. Its duration tends to be varied, but generally, it starts to fade within three or four months. To prevent scarring, never pick at your baby’s acne. If your baby’s acne lingers beyond the 6-month mark, a trip to a pediatrician may be warranted. If you want to learn more about how long does baby acne last, click here. However, neonatal acne is generally harmless and is safe to treat at home. If your baby’s acne shows no sign of clearing up on its own or becomes more severe, you may have to take matters into your own hands. A simple regimen may be just the ticket to return your sweet son or daughter’s face to silky smooth. Pustules – inflamed acne that comes to a head. Milia – hard white bumps on cheek and nose that are filled with keratin. Comedones – includes both blackheads and whiteheads. 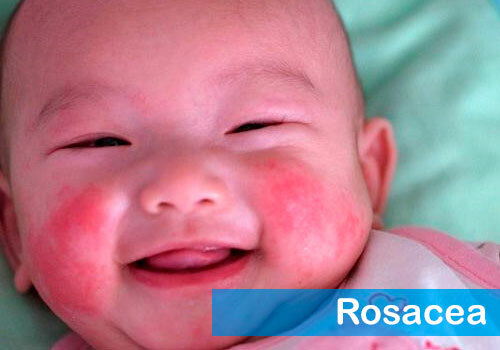 Rosacea – pustular rash accompanied by a flush on the cheeks, nose, and chin. Proper identification of the type of acne is essential for proper treatment. For instance, non-inflammatory acne (such as millia and comedones) will not respond to anti-inflammatory creams. Fortunately, nodular acne does not occur on babies, sparing them the pain and scarring of this terrible form of acne. A baby’s skin is significantly more sensitive than an adult’s skin. While it may be tempting to apply a powerful cream or scrub, by doing so, you may actually harm your child and make the condition worse. Above all, be kind and gentle to your baby’s skin. Never use harsh chemicals, oils, or balm. When in doubt, ask your pediatrician. A host of acne on your baby’s face or body can be quickly treated using mild methods. If you’re wondering how to clear up acne, something as simple as a non-foaming cleanser applied with a soft washcloth and rinsed off with lukewarm water may be all that you need. You may need to dab a light layer of anti-inflammatory hydrocortisone cream to the spots if they persist. Diaper balm can be applied to body acne. However, it should be used sparingly, as topical steroids are one of those remedies that can gradually thin the skin and cause lasting damage later on. Lightly dampen your baby’s skin with lukewarm water. Gently apply a non-foaming, specially formulated cleanser to baby’s face using a microfiber cloth. Rinse it off thoroughly using tepid water. Pat the skin dry with a fresh, clean towel. Do not scrub. Follow up with an unscented, non-comedogenic baby lotion. If desired, you can apply hydrocortisone cream (once a day for up to two days) to the active spots. If you fastidiously follow this regimen, you can expect to see clearer skin within a week as old acne lesions dry up. Furthermore, it will successfully prevent new acne pimples from forming. Please note that if the neonatal acne remains beyond six months, the condition that your baby is experiencing may not be acne. At this point, you may have to consider the fact that your child is suffering from another, different condition which may have to be diagnosed by a pediatrician. If you’re hesitant to treat your baby’s acne because you fear the risk of harming him or her by using harsh chemicals, you can breathe a sigh of relief. Cornstarch: A paste of water and cornstarch (in 1:1 ratios) applied to baby’s skin will dry out overactive sebaceous glands. Let it dry for one hour, then rinse off. Coconut oil: Coconut oil is a proven anti-inflammatory. A thin layer of this smeared onto your baby’s skin will calm down even the angriest outbreak. Please see detailed descriptions here. Breast milk: Your own breast milk has lauric acid, which has healing properties. Dab it onto baby’s face using a cotton ball and let dry. Apple cider vinegar: Use a highly dilute solution of ACV and water (1:4 ratios) and swipe it across your baby’s skin as an effective and natural toner. Rinse off. Further details can be found here. Oatmeal: An oatmeal bath will soothe and moisturize any broken-out skin. Add a cup of ground up oats to your baby’s next bath to calm down an acne rash. Sometimes the best treatment is prevention. If your baby has an outbreak, take a hard look at your diet. Whatever you eat can be transmitted to your baby via your breast milk. A simple elimination diet can remove any allergens from your milk, which may clear baby’s skin. Also consider any soaps and detergents that you baby may come in contact with as potential irritants, as they may be causing the problems. Nobody likes to see their precious little child struggling with acne. While the acne may not bother your baby personally, a mother or father’s heart aches with love when they see any signs of illness on their children. That’s why it’s absolutely critical to know how to treat baby acne. Not only will it lead to the softer skin on your child, it’ll ease your mind and help get rid of any anxiety about the health and wellness of your child. Keep baby’s skin clean with a mild, non-drying soap. Avoid dressing your baby in scratchy, abrasive clothing. Use all-natural treatments on existing lesions (such as cornstarch, breast milk, and coconut oil). Undergo an elimination diet to rule out allergens. Abstain from using heavy, pore-clogging creams and lotions on baby’s skin. If all else fails, consult your pediatrician to rule out other possible conditions and obtain a prescription medication to cure the acne. If you adhere to these six remedies, you’ll be certain to rid your poor baby’s skin of neonatal acne once and for all. All parents deserve to be proud of their baby. Acne doesn’t diminish the value of your child, nor does it reduce your love for him or her. Above all, remember that there is no such thing as an ugly baby, and having acne does not mean your infant is hideous. However, for your own peace of mind, if you follow the advice in this article, your baby will have smooth, clear skin and your worries will be no more.